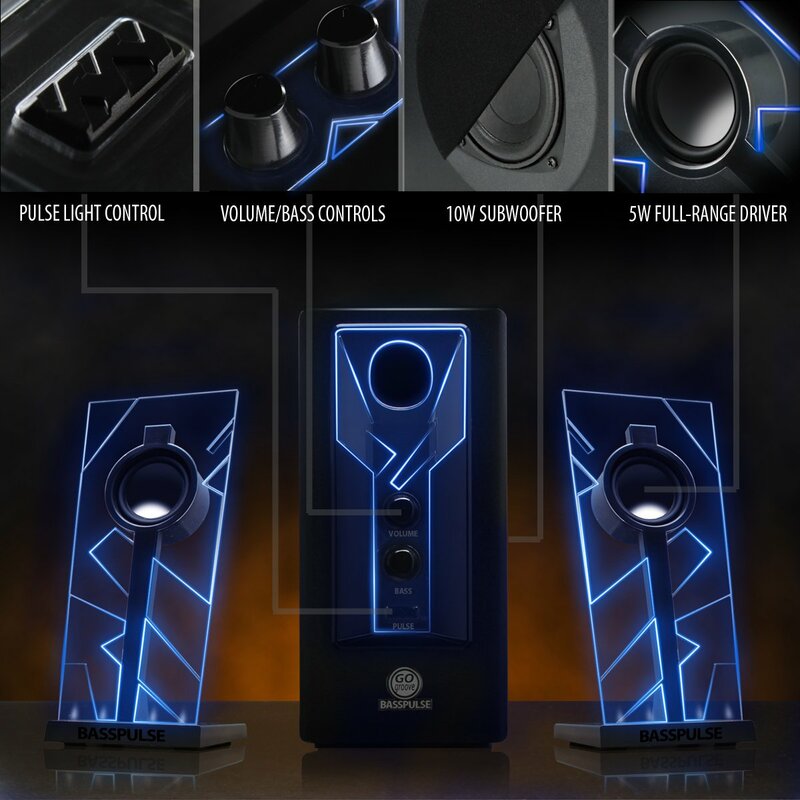 Here’s my GOgroove speaker review, these speakers have premium audio quality while also delivering the luxury of glowing LED lights. If you’re looking for premium computer speakers with a good audio frequency range while also having a thundering bass then these are most likely the speakers for you. Super crisp highs and hard hitting lows is what these speakers deliver as far as audio goes. These speakers not only sound good but they look amazing as well. The design itself will ensure comments from people about how cool they look and then once they hear the sound they’ll be in awe. In my opinion these speakers are among the top tier of speakers, especially for the price point of $59.99. When comparing them to other computer speakers at this price point such as the Arion Legacy AR506-BK 2.1 speaker system or the Logitech LS21 2.1 stereo speaker system you’re getting more bang for your buck based simply on the overall design. Although the Arion Legacy speaker system may have dual-subwoofers, it has a worse overall rating than the GOgroove speakers. The Logitech LS21 speaker system basically has the same sound quality but with no cool LED lights and it’s a couple bucks more expensive. Let’s take a look at some of the features that the GOgroove BassPULSE speakers bring to the table! Premium 2.1 channel speaker system with full-range satellite speakers & side-firing sub-woofer for powerful, clear audio with basically any computer or tablet. A bold, modern design with translucent acrylic molding and electric blue/red LED accents. When the bass equalizer is turned up past 80%, the glowing lights will begin to pulse to the beat of the bass! Guaranteed Quality – Includes 3-Year Manufacturer’s Warranty. The 2.1 channel speaker system ensures the highest quality of sound. These speakers have taken today’s audio technology and innovated it into a slick design as well as a nice sub-woofer to go with. They’re able to plug into any PC, Mac, iPad/iPod, Laptop, ANYTHING that has a 3.5mm AUX audio output will be able to utilize these awesome speakers. If you have audio OCD then you’re really going to love these speakers. What I mean by “audio OCD” is if you’re an individual that likes to mess with bass levels and fine tuning your audio to your own personal optimal level. Once the bass gets increased past the 80% level then the LEDs on the speakers actually dim out lightly on every bass hit. This is a really cool feature because it just goes perfectly with the game/music that is playing out of the speakers. Awesome feature. These speakers come in blue and red LED accents. The LEDs are super bright and will bring attention to anyone. The acrylic design of these speakers is also very durable so you shouldn’t have to worry about these speakers breaking any time soon and heck if they do you’ve got a 3-year warranty with GOgroove so you’re all set there! All in all, if you’re looking for a speaker system that not only delivers on super high quality audio but also gives off a great ambient, luxury setting then these are definitely the speakers for you. You can’t go wrong with the price and the sub-woofer is going to be some kind of awesome once you experience it for yourself! So what do you guys think of my GOgroove speaker review? Are you going to be grabbing these speakers for your system? Tagged best computer speakers, computer speakers, gogroove speakers, led speakers. Bookmark the permalink. This was a great review. I was actually looking into buying some new speakers. Would you happen to have a review for some great gaming headphones at a good price? I actually have reviews for a few different brands of headphones. I have a list of some good cheap gaming headsets, a review of the Logitech G930s and I also reviewed a headset that I currently use which is the Plantronics GameCom 780 headset! Take a look at those links, I’m sure you’ll find a headset that fits your needs! Wow – You’re giving 10 out of 10. It doesn’t get much better than that. I don’t want to be a spoilsport but I’m at an age and of a disposition where LEDS would hold no interest, but on the other hand I do like the spec. I have a set of Altec Lansing speakers that cost me an arm and a leg when I bought them (about 11 or 12 years ago). They’ve served me very well – but alas – they are well beyond their best by date. My head was set on another set of Altec Lansing (if they still make them) but your 10/10 review has made me think – especially if I might be getting a better deal at a cheaper price! Thanks for the comment, Eoin! Wow, these are fantastic. I have been trying to think of a birthday present for my brother for next month. He loves his computers, music and gaming, these GOgroove speakers will be great for him. In fact, seeing as the lights are also in red, why should he have all the fun. My speakers are old and tired. As you can guess I am bookmarking this page so that I can get a couple. Thanks Lis! Yes these speakers would be a GREAT gift idea for anyone that wants to have some high quality sound while also being able to enjoy the luxury of its design! Wow. These GoGroove Speakers are absolutely gorgeous! I’ve always had bad luck with cheaper computer speakers, as they break after very little use. Maybe I should invest a little. It seems very well constructed, fun to both watch and listen to, and looks longer lasting than other technology I see! 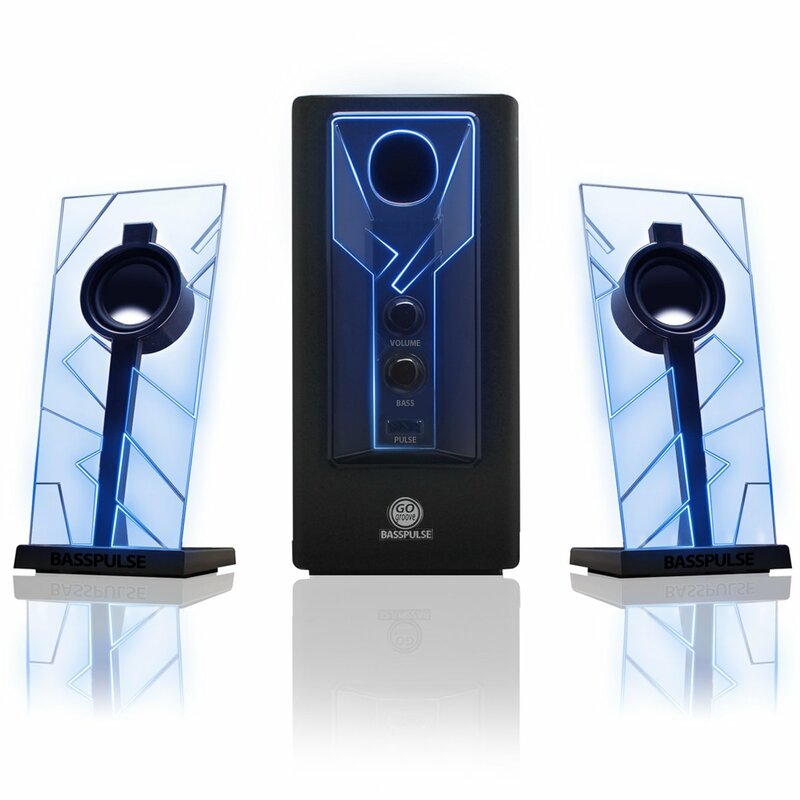 These speakers are extremely durable and they come with a 3 year warranty just in case they were to break! So these would be perfect for you 🙂 the extra investment here is worth it! Very concise yet detailed review although it is not instructions per say you do know what you are getting. Well done. Thanks! Yup the speakers come with a manual but they setup just as any other speakers would! Nice review! Would these be a good option for a gaming system or would you recommend something else? I’m on a tight budget but might be able to swing these if you think they’d be a good pick for gaming! These speakers are awesome! I bought them a few months ago and they are great. The price ain’t bad too. My thoughts exactly Julian, great speakers for this price point! Speakers look great, seem like they sound great, and they come in blue. Perfect for my build if I ever need speakers, but for now? Naw, can’t get em’. But if I do, these sound perfect. A buddy of mine actually has these exact speakers and the sound quality is pretty good. They look awesome! !